Let us be your business IT service for a fraction of the cost of hiring in-house! Santa Fe Computer managed IT services are designed with small and mid-size businesses in mind. Our certified technicians provide fast, affordable business computer services, networking and IT support services. We work with all of our clients to ensure they have the right hardware and software to meet their company’s needs. We have same day, weekend and evening appointments available. Though any business with a computer or network is someone we can assist, here is a list of industries we have a lot of experience serving. Santa Fe Computer excels at computer and network troubleshooting issues, reducing your overall computer down-time and support costs. Local computer repair service and on-going maintenance will increase your efficiency, communication, productivity and employee job satisfaction. Get good computer networking advice from local professionals. 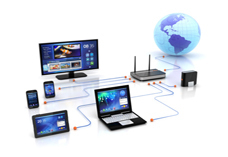 We can help fix or design your hardwired or wireless network. Fast internet is essential to running your business. We can help you get the best Internet Service Provider for high speed internet in your area. A small business may not have the time, money, or resources to hire a full-time IT person. However, smaller companies still have technical issues that may need immediate handling. For example, if a server crashes or your network falls prey to a malware attack, repairing and/or replacing everything can cost a lot. Santa Fe Computer managed IT services can help you get back to work. Whether you're a small or medium sized business, we are here to provide you with an affordable, friendly, and practical IT support Solution. Our Microsoft Certified IT Specialists will provide you with the highest quality IT service solutions, quickly, to ensure minimal downtime for your Business. All logos, copyrights and trademarks belong to their respective companies.